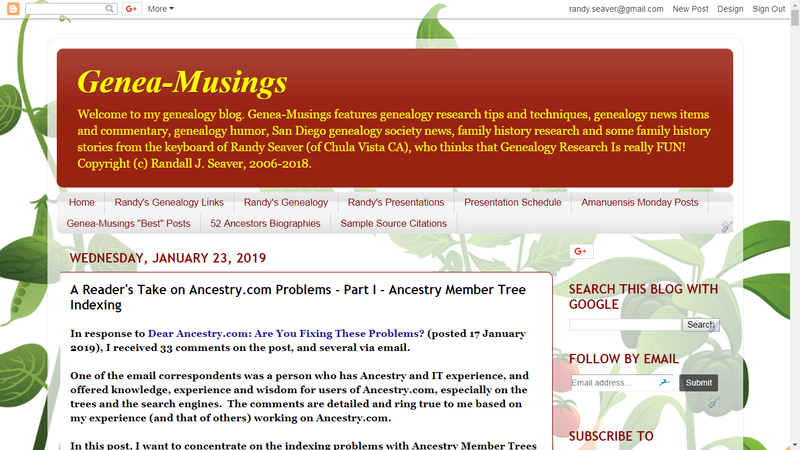 1) Attended the Chula Vista Genealogical Society program meeting on Wednesday, 30 January. The speaker was Annette Hubbell who did her second "Women Warriors" presentation - 10-15 minute vignettes of four historical persons in character - Elizabeth Fry (1780-1845, Amy Carmichael (1867-1951), Anne Bradstreet (1612-1672) and Gladys Aylward (1902-1970). 2) Transcribed another deed for Amanuensis Monday - 1835 Deed of Samuel Warner to Zachariah Hildreth in Townsend, Mass. I found 11 more deeds from 1836-1846 to continue this series. 3) Wrote a biography of 6th great-grandfather #432 James Vaux (1704-1776) of South Petherton, Somerset, England for my 52 Ancestors post on Friday. 4) Watched one Family Tree Webinar this past week - The Every Day Lives of Our Ancestors, by Ann Staley. 5) Participated in today's Mondays With Myrt. Subjects discussed were One Pot Meals for genealogists (a Facebook group), the FamilyTreeDNA terms of Service issue, Pat found her great-grandmother's marriage record on the new Findmypast app, I talked about the Ancestry Search problems, Tony updated his Metaproxy program, Myrt discussed LucidChart which the DNA pros use, and we discussed our favorite links websites. 6) There were several sessions working in the RootsMagic software program to update FamilySearch Family Tree profiles for Seaver families and other ancestral families, with occasional additions to the RootsMagic profiles. I have matched 29,179 of my RootsMagic persons with FSFT. 7) I continue to use Web Hints from Ancestry, MyHeritage, Findmypast and FamilySearch to add content and sources to my RootsMagic profiles. I now have 52,197 persons in my RootsMagic file, and 100,790 source citations. I TreeShared three times during the last week (about 300 profiles), and resolved about 500 Ancestry Hints. I've fallen behind on the Ancestry Record Hints with 93,612 waiting to be resolved, but I work on them weekly. 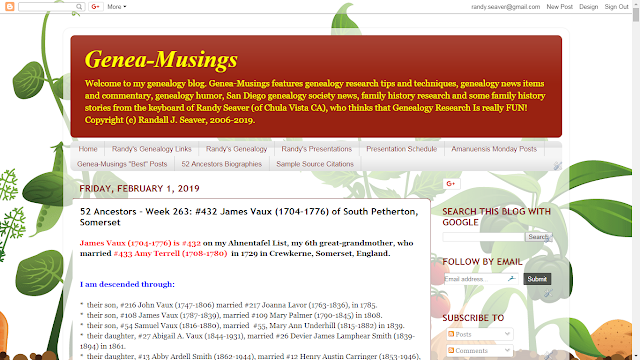 8) Wrote 17 Genea-Musings blog posts last week, of which two were press releases. The most popular post last week was A Reader's Take on Ancestry.com Problems - Part II - Ancestry Search Engine Problems with over 1,455 views. 9) The heavy rain on Saturday scrubbed our attempt to go to see Tami's family in Huntington Beach, but we may go on Thursday this week to see the grandgirls perform in the play "Seussical." If it doesn't rain.